I have lots of topics on the pipeline, I am lagging behind “my house plant series” and “national flower series” but I cannot help but to write this post for fierce that it will slipped away from my mind. Am I right in saying that “blog is best written when you idea is fresh”? Well, creative food series is a series that basically outlined the foods that I prepared out of no where. 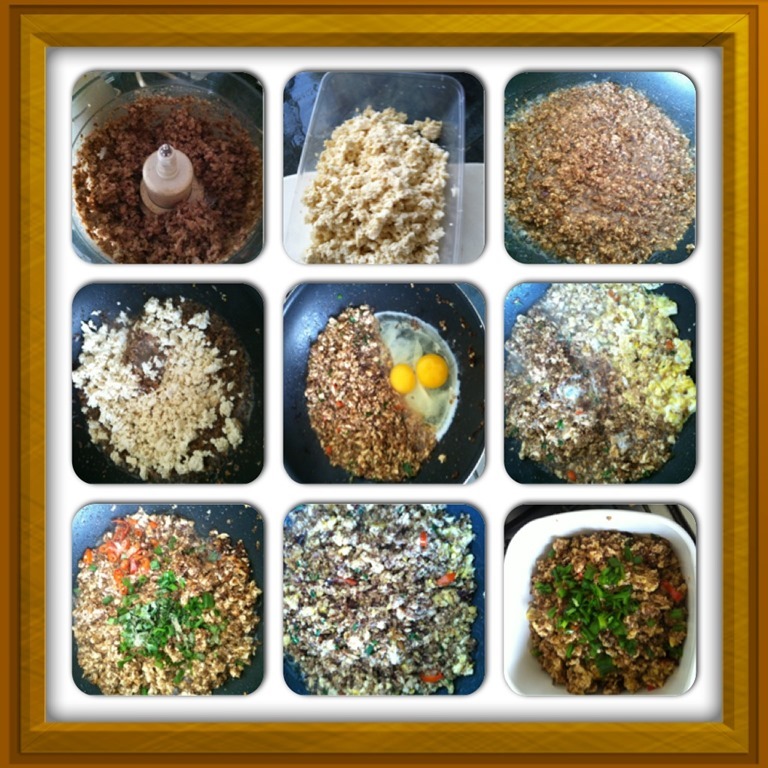 Based on the ingredients that I have on my house, based on the ideas that I have my mind, I mixed and matched and I came out with some new dishes that I would think edible and accepted by my family members. Since young, I do not like rules, I always think out of the box, I do something that my peers are not doing and it ended up being termed as radical, self centered, anti-social and is explained here WHO IS GUAI SHU SHU? The same applies to cooking, I have never accede the do and don’t in cooking but I do appreciate such guidelines (not rules or laws that you have to abide) and treasure very much about traditional ways of cooking believing that there are reasons behind each recipe provided by our forefathers. Usually, for Chinese, we usually cooked more than we would otherwise have consumed within a day for some important reasons. Braising requires a lot of condiments like various types of soya sauces and spices such that the meat will be well covered. It is impossible to consume all the sauces within one day and naturally more meat were being braised using the same amount of sauce (is it economies of scales? smile). As the braising condiments and spices by nature are good preservatives, that also contribute to the rationale behind braising for more because the braised meats will not turn bad easily. Lastly, braising process is actually quite laborious and braising (or other longer method of cooking like smoking) for one meal is something that I would never do (not “cost-beneficial” to do so – cost is not in monetary terms but the amount of efforts you put in”). Put aside the health conscious and food contamination issues, I would definitely braised for more and if my ancestors can consume these foods until they died of old age why not me? The above also explained why braised duck, meat and etc. were usually one of the items prepared for festivals and ancestors offering among the Chinese Community in Singapore and Malaysia. Traditional offerings to ancestors or gods need to be grand and usually involved offerings of three ducks, four chickens etc. (Number of chickens and ducks indicated here are what we usually offered to my ancestors when I was young). If you have read my post earlier, a few days ago, I have braised some eggs and pork belly as my kids want to eat braised eggs. The next day, I used the left over sauce to make the “lor mee” or noodles with braised sauce, a popular hawker items in West Malaysia and Singapore. As my wife and kids are not in favor of the meat, I have quite a lot of leftover braised meat. Throwing away these meats is a waste and a torture to me. To market my leftover braised me, I have to think of a way and the dish “BRAISED PORK BELLY FRIED WITH TAUKWA” is born. Before I proceed, a bit about taukwa for those who is not residing in the Asian countries. 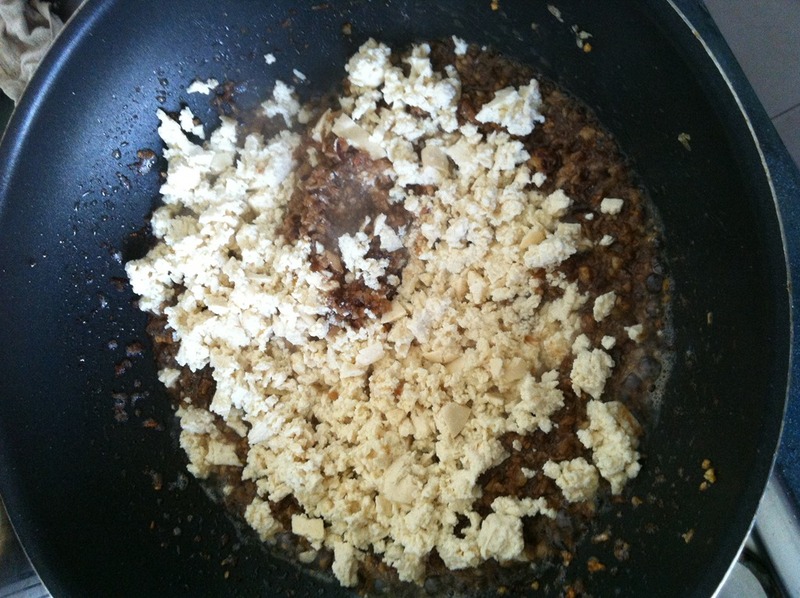 It is a type of soft, jelly like bean curds called “tofu” but have a firmer texture because there are less water content and ideal for popiah, Yong Tau Fu, braising etc..
Mincing of braised meat — meshing of taukwa – frying onion and garlics – add in minced meat – add in taukwa – add in some eggs – add in condiments – add in spring onions and chopped chili as garnishing item – Done! 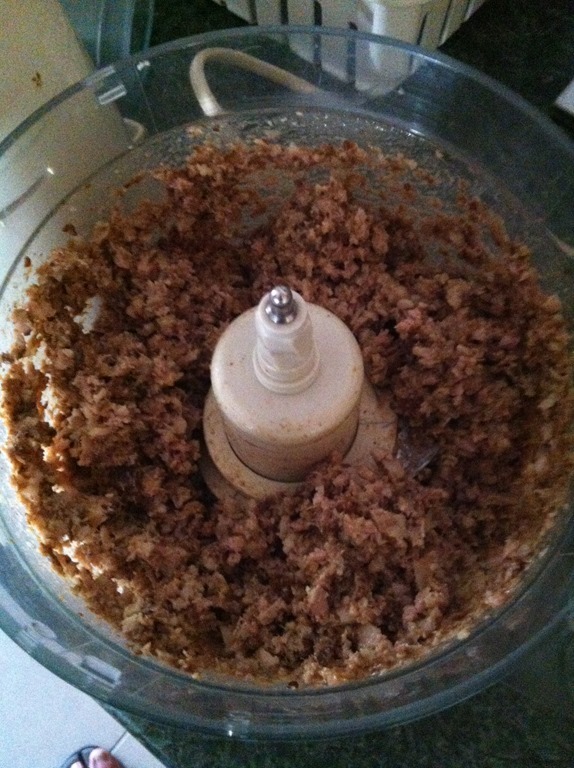 Firstly, I minced my braised meat until very fine. As my family members don’t fancy meat that are slightly hard and “fibrous”, if I just heat up and serve on the table, they will give me back the same thing. 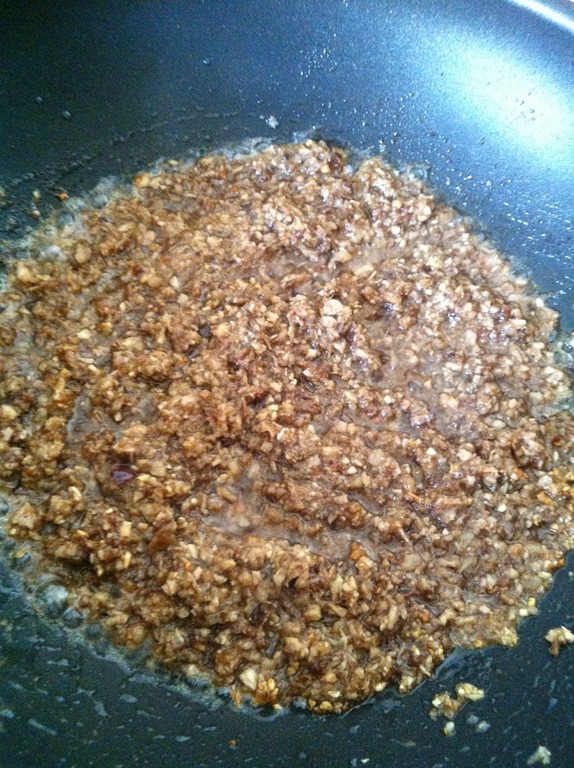 Therefore, I decided to mince my braised meat very fine until they cannot tell what is this. Again, realizing the meat texture may be slightly harder, I went to the fridge, found a piece of taukwa and meshed it coarsely. I believed that taukwa will be able to cover up the meat elements and since it is pork belly, meshed taukwa will help to absorb some levels of fats excreted when frying the minced meat. 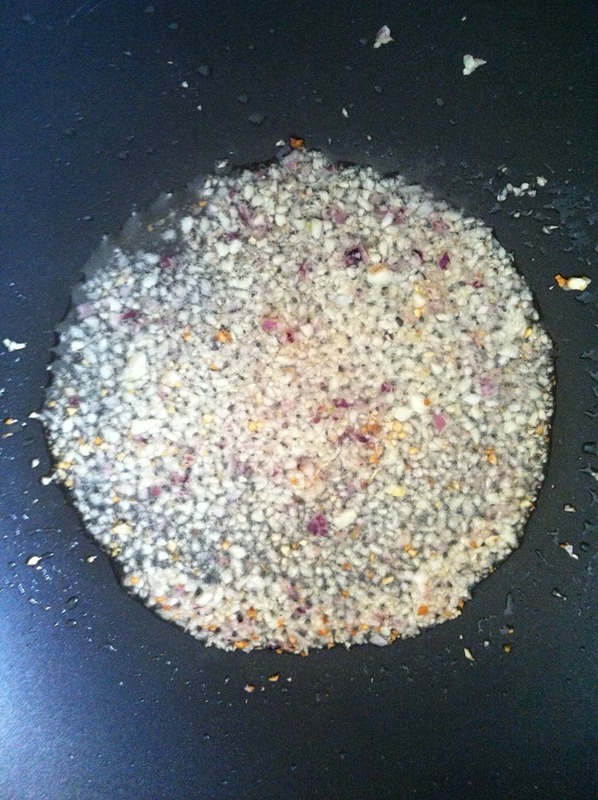 I take a wok, put some oils, some chopped garlic and onion, some pepper and salt until the fragrant spread in the house. Sorry, I can’t help but still doing this traditional Chinese cooking step to make your dish smell nicer and in Chinese, it is called “Baoxiang”. 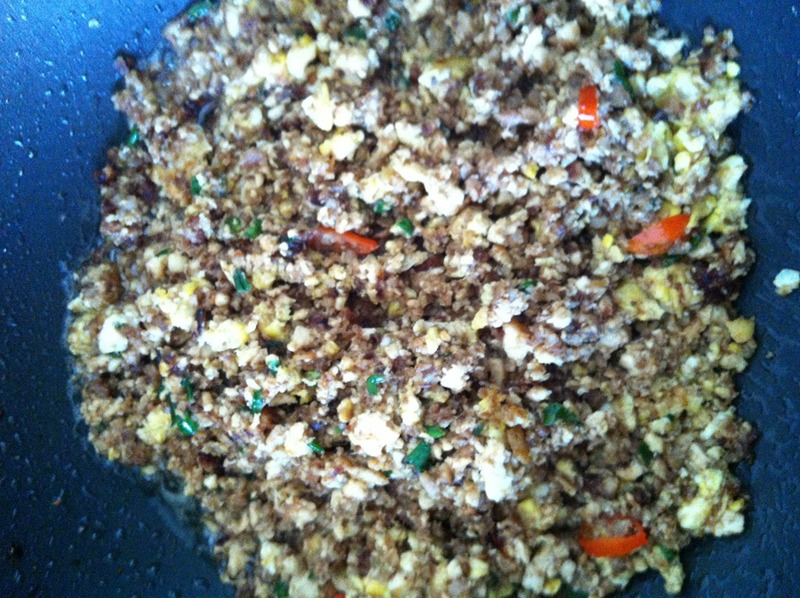 It is also the step that made Westerners perceived Chinese cooking and the dishes are too oily! Actually, since it is pork belly, I should be more adventurous by using the fats excreted by the pork belly to fry the onions and garlics. After the chopped garlic and onion turned slightly brownish, I add in my minced pork belly until I smell the aroma and followed by adding the meshed taukwa. I started to get excited about my new dish as it really smell nice especially the new type of fragrance variegated from a mixture of pepper and braised meat flavor. Still concerning that my kids may not like it and I know they are egg fanatic, I decided to throw two eggs to add to the flavor and again assumed the role of fat absorption. 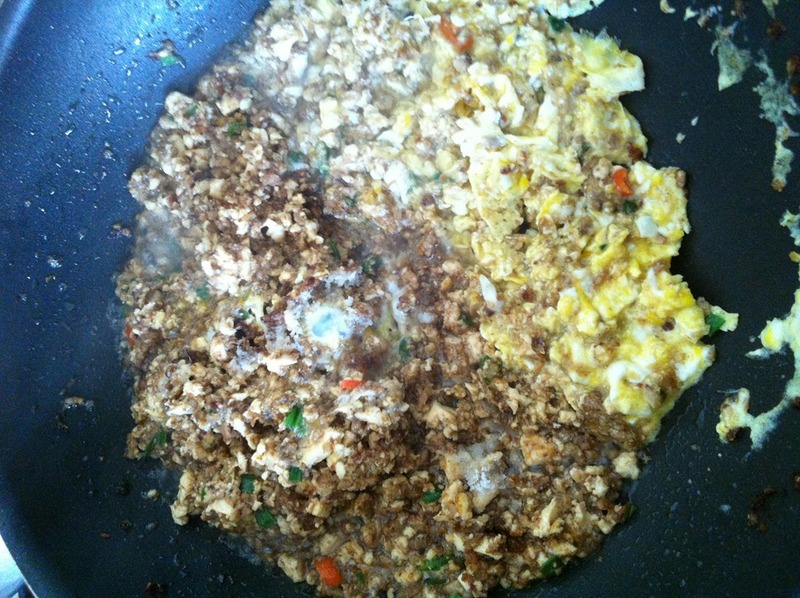 Yes, that is, the eggs negated the meaty flavor and reduced the fibrous texture. 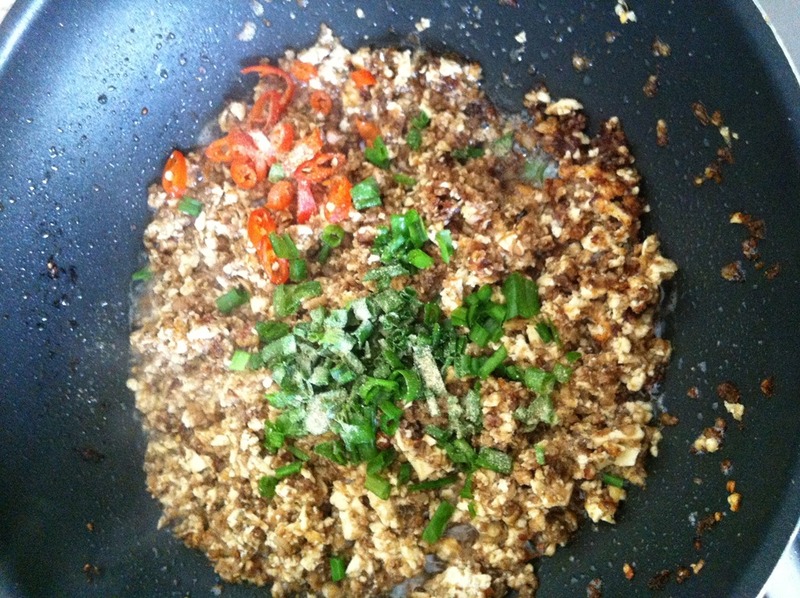 The “mixture”, I decided that no further improvement is necessary except with a little bit of some traditional condiments such as light soya sauce, oyster sauce and again pepper. 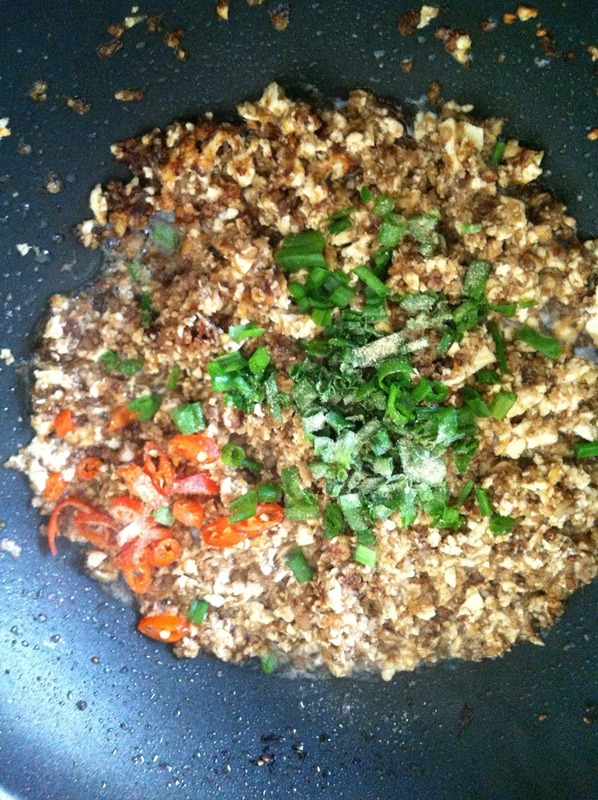 I then garnished with some chopped red pepper (chili as is commonly called here) and spring onions. I take a spoon and tasted it, I told myself, well done and no regret in cooking this dish. Prior to cooking this dish, I have no idea what is the “output” going to be like. 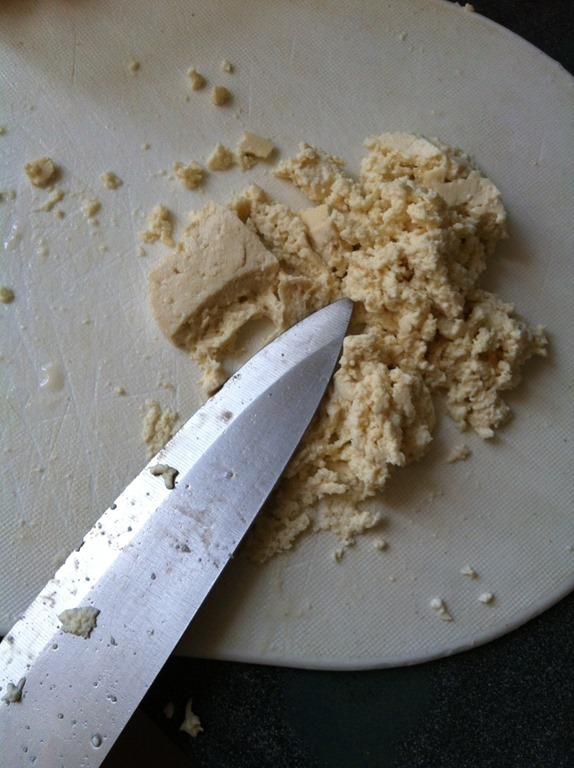 After preparing, I will give credit to this “mixture” because of the new texture and new taste. Well, that is not the end, whether the dish is successful of not is still subject to the tasting of my two kids especially my girl who is very particular any things that cooked with pork. My boy is eating his lunch with a plate of white rice, this dish and a bowl of cabbage soup. He immediately thumbs up signaling me that the dish is nice and ended with two plates of white rice. My girl coming back from school and as usual, she asked me what is today’s soup in the lift before reaching the house. I just told her that it is cabbage soup and a dish that her brother likes it. She kept guessing the common dishes that we cooked but I refused to leak out a word. Immediately when I reached my apartment, I took a plate of white rice and mixed with the new dish and stuffed a spoon of rice into her mouth. She yelled and complained that it is too hot. I insisted and she took my spoon and scoped one for herself. She yelled again but this time is not complaining but complemented that this was “exceptionally nice”. 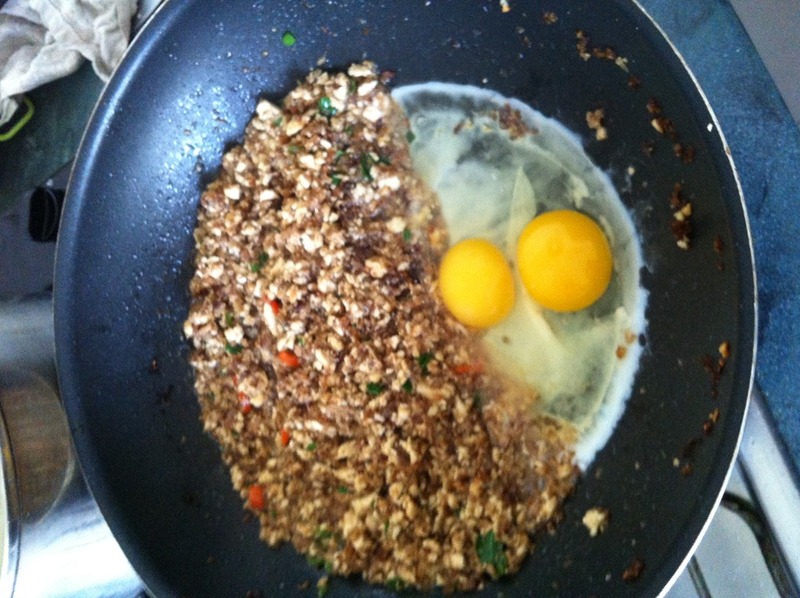 I asked her to guess what were the ingredients, she managed to guess correctly the eggs and the taukwa. 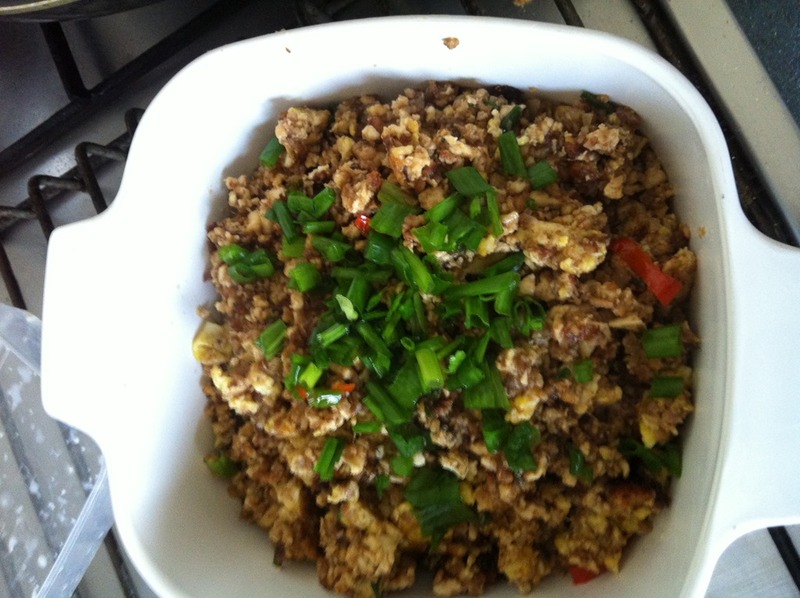 I hinted to her that she have forgotten one important item that I usually braised together with the eggs. 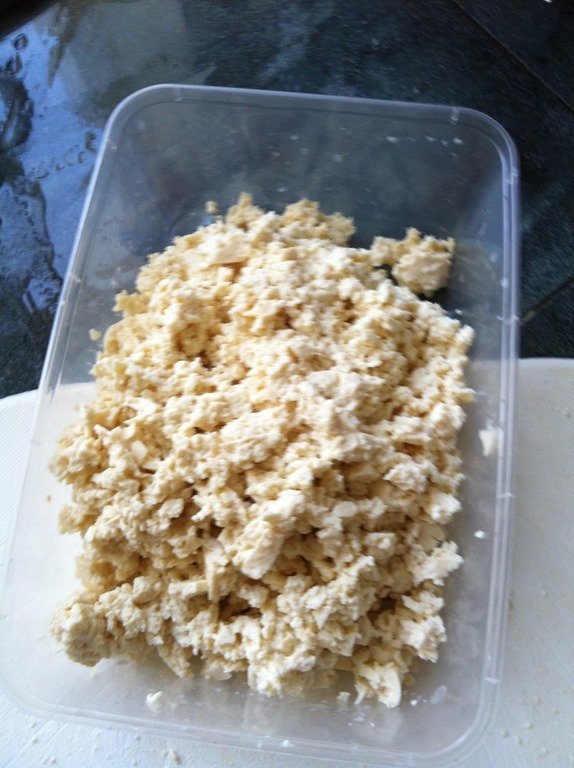 She started to guess from taukwa, taupo, eggs…. and I told her the item’s name have no “tau” (meaning bean) in it. Lastly, she said is braised meat. I laughed and say yes. She screamed and said, goodness me, I have eaten meats that I hated most and reluctant to proceed with her lunch. Don’t be shy to try your own version. If you are foodie, you should use your own sense of smell and logic and create some versions that tailored to your family member’s taste. Is it not what our forefathers or restaurant chefs have done when creating their very own “signature dish”. 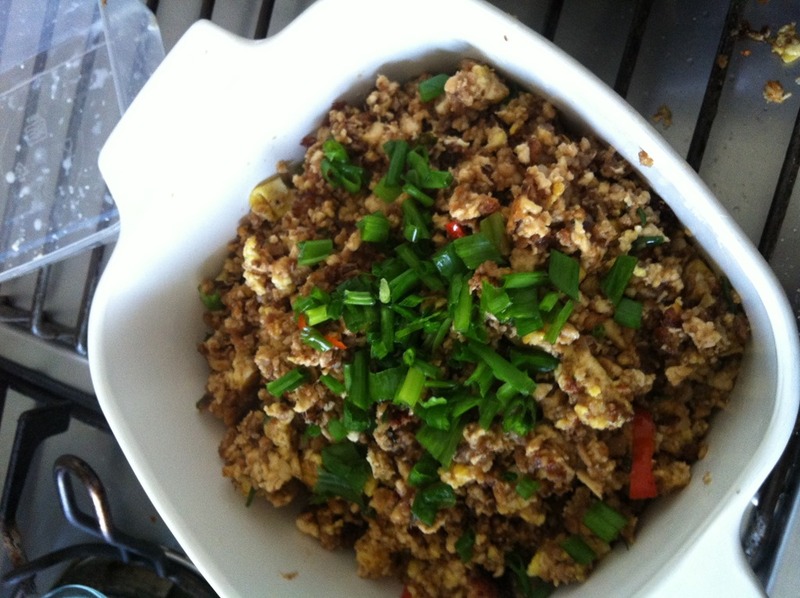 This entry was posted in Dish and tagged 10, braised meat, braising, CHINESE, chinese cooking, Chinese meals, creative food, Creative Food Series, malaysia, pork belly, singapore. Bookmark the permalink.